Introductory Korean A & B: These two courses together are equivalent to First Year Korean I. The courses are designed to develop the four language skills: listening, speaking, reading, and writing as well as grammatical knowledge. Students will also take a deep dive into the culture of Korea. First Year Korean N & Second Year Korean N: Classes intended for students with no Korean background. First Year Korean I/II & Second Year Korean I/II: Basic training in Korean through listening, reading, speaking and writing skills and grammar for students who have some Korean background. Third Year Korean I/II & Fourth Year Korean I/II: Third Year Korean offers two sections, while Fourth Year Korean has one section. Additional individual help is offered to accommodate different linguistic levels and to meet students’ different needs and goals in studying Korean. 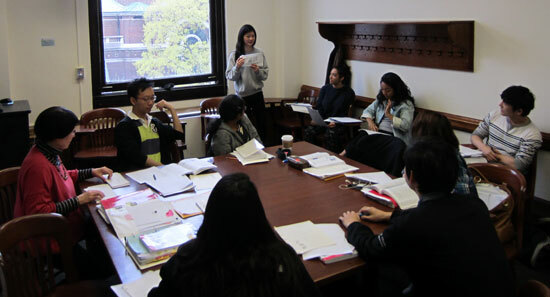 Fifth Year Korean I/II: This course offers one section. It focuses on readings of advanced modern literary, historical, political and journalistic texts, and a wide range of materials. This course is a requirement for Ph.D. students in Korean studies. Advanced Korean in Mixed Script: This course is offered every other year (fall semester only). It is designed to provide both M.A and Ph.D. students in Korean studies with the necessary skills for reading advanced Korean in mixed script. It focuses on the period from the late-19th century to the mid-20th century. The requirement for Ph.D. students in Korean studies.